Get a hundred or two, or get a box full. Full details below. Shipping is Extra: First Class/Priority Mail in USA, and Airmail elsewhere. 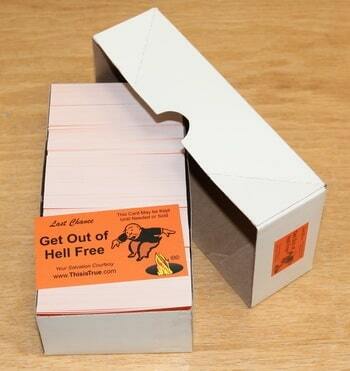 The gorgeous full color, two-sided, matte finish classic design Get Out of Hell Free cards on heavy card stock (14 pt, for those of you who know paper). The back gives a brief explanation of what it’s about — fun! It’s a gorgeous card that’s super fun to give out, and recipients really want to keep. Thanks to the matte surface, you can write on these cards, unlike the previous glossy finish. Jumbo pack of 500ish cards. A box stuffed full. We don’t count ’em, but it’s around 500 cards — it almost weighs a pound and a half! Do people really need that many? 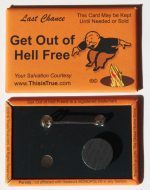 Well, they’re awful fun to hand out, and many have come back for another box …and then another, and then another. Yeah, they’re that fun, and they really make the recipient’s day — especially harried waitresses, postal clerks, or anyone having a bad day (or just had to deal with a difficult customer). 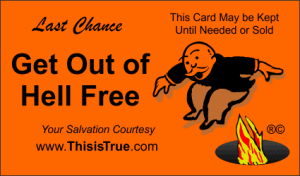 Buy only what you need: because they are priced at the break-even point, the cards are not returnable.